Have you heard of Emma's Mode? If you haven't, now is the time to check them out. Emma’s Mode is an online retailer inspiring women to look their best by offering stylish, yet affordable fashions. From stylish dresses to trendy shoes to the season’s latest fashion accessories, Emma’s Mode is committed to its mission that fashion should be affordable and fun. I was given the opportunity to try out a couple of the fashions Emma's Mode features. I selected the Yellow Floral Round Toe Ballet Flats and the Furry Sleeves Loose Pullover Knit Sweater in ivory. When the products arrived, I was really excited to try them out and on! 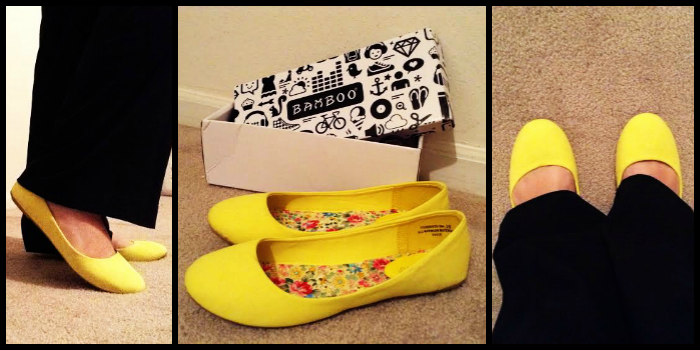 My first try on was the Yellow Floral Round Toe Ballet Flats. I really love the color yellow. Aside from pink, yellow is my favorite color. I can't choose between the two. But something about yellow shoes really drew my eye. The brand is Bamboo and they are a simple basic flat. The material feels like a sturdy canvas material with a hard, synthetic sole. The inside is a cushion floral print. Very basic yet really nice. I really these shoes. They slip on and off nice. I think they really compliment any outfit and make a pop of color which stands out. These would be great to wear in the office with a formal pant or just lounging around in your jeans for an afternoon of gossip with the girls. The Yellow Floral Round Toe Ballet Flats are available for $13.80 on the website and come in a variety of colors. If yellow isn't your thing, there are many other colors to choose from. My second item to review was the Furry Sleeves Loose Pullover Knit Sweater. This is a really cute and beautiful sweater. It's really comfy too. I chose this sweater in the color ivory. I really love how soft it really is. Especially the sleeves. It really does fit it's name. It fits nice. I think it may be a bit too snug in my hips but that is my fault. I need to hit the gym more and lose that extra baby weight that has been sitting on their since my last pregnancy. I can see myself wearing this out anywhere. It's warm, comfy, and can be dressed up or dressed down. 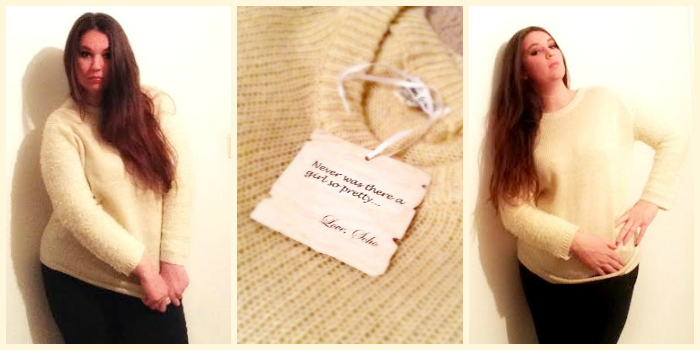 I really loved the tag that was attached to the sweater. It read, " Never was there a girl so pretty ..." I think every girl deserves to feel pretty so this was a great reminder. So if you are looking for some great styles at an affordable price, check out Emma's Mode. You will find everything you need from handbags to leggings and all in between. Great styles, great fashion, great prices!